All of us in the Clacton League were saddened to learn of the death of John Long who passed away just before Christmas. 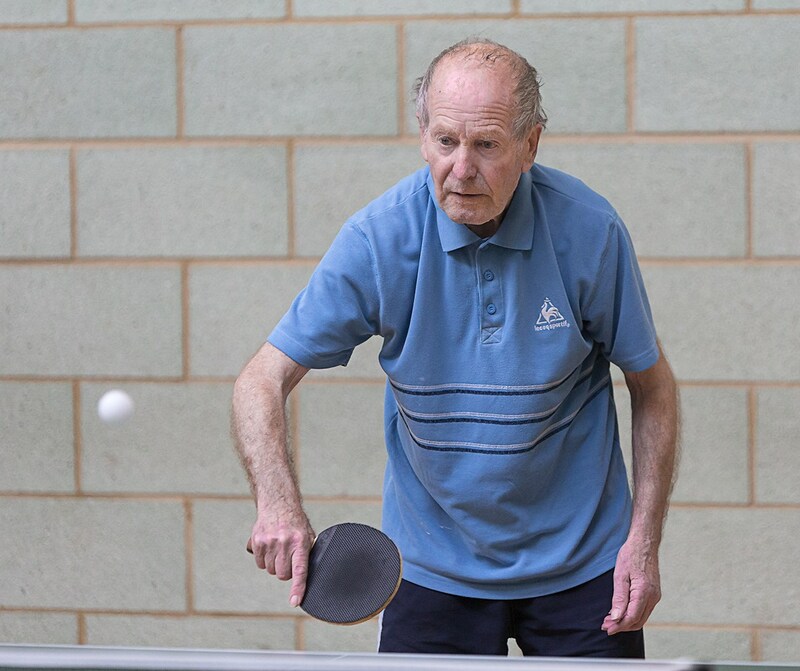 It was a credit to John that he carried on playing competitive table tennis well into his eighties, continuing to play in his traditional style, dancing around the table determined to win every point. It is also to John's great credit that, even though he'd once been Clacton's Mens Singles champion, he was prepared to move down the Divisions, such was his love of table tennis and desire to compete. In his prime, John was a top-class player winning League, Cup and Closed Championship trophies. He won his first major Closed trophy in 1967 when, with Sheila Howe, he took the Mixed Doubles title, retaining the title the following season. Five years later in 1973, John achieved the pinnacle of being crowned Mens Singles champion for the first and only time, defeating Len Meakin 21-9, 21-11 in the final. But a Mens Doubles title always eluded him, his closest effort being in 1982 when, partnered by John Holt, he was a losing finalist. On reaching the Veterans stage, John dominated the event for ten years between 1978 and 1987, appearing in eight Veterans Singles finals. He won the title four times, in 1977, 1980, 1981 and 1983, those four wins ranking him third in the all-time list of Veterans Singles winners behind Ken Gladwell and Derek Wood. And when a Super-Veterans event was introduced, John once again dominated that event in its early stages, winning the inaugural Super-Vets Singles title in 1999, and taking it twice more in 2000 and 2003. John also tasted League success with a Division One winners' trophy in 1997 in the Walton B side with John Holt, Claude Snell and John Rice. It was something of an Indian Summer for John who, that season, finished eighth in the rankings with an average of over 75%. There was also success in the Knock-Out Cup with Walton B in 1983 alongside Holt and Brian Rowlen, and again in 1993 when the Walton B side of Long, Snell and Holt won a classic match 5-4 against the 'young Turks' of St Andrews A, Martin Hogg, Iain Vine and Colin Stallwood. At the time, the Walton side was credited as being the oldest team ever to take the trophy with a combined age of over 150 years. In his fifty-plus years of local table tennis, John won many trophies but he'll be always be remembered as a player full of enthusiasm for his sport, a player who always gave one hundred per cent every match, a player who was a dogged, determined opponent who refused to give up. As importantly for anyone who knew him socially, John was an easy-going, mild-mannered and amiable friend, a true gentleman on and off the table who never had a bad word to say about anyone. We'll miss you, John.